An artist's view of a star lighting up the atmosphere of its planet. When starlight strikes the atmosphere, molecules that could indicate the presence of a habitable environment emit radiation that can be detectable by Earth-based telescopes. Stellar storms, or eruptions of material that are regularly spewed into space by stars, could help scientists search for potentially habitable environments on alien planets, according to a new study. Most stars, including the sun, produce explosions on their surfaces that spit powerful particles out into space. These expulsions can rain down on nearby planets, and the new study shows that these interactions could create chemical "beacons" in the planetary atmospheres that reveal the presence of potentially life-friendly environments. "These are the basic molecules that are biologically friendly and have a strong infrared emitting power, increasing our chance of detecting them," Airapetian said. "A good candidate for hosting life"
Because Earth is the only known habitable world so far, scientists use it as a guide for what to expect when hunting for life beyond the solar system. Water vapor, nitrogen and oxygen are all products of life as we know it. While the sun releases a relatively light stream of charged particles and occasional, energetic bursts, other stars can release far larger, more energetic and more frequent doses that bathe their nearby planets. If the charged particles interact with the atmosphere of a planet containing those products of life — water vapor and molecular nitrogen and oxygen — the interaction could trigger a cascade of chemical reactions that form what Airapetian and his colleagues call "atmospheric beacons" — molecular oxygen, nitric oxide and hydroxyl (one atom each of oxygen and hydrogen, bound together), according to the statement. Then, if the conditions are right, researchers could detect those beacons. As light from the star hits the planet's atmosphere, it would cause the beacons to send energy into space as infrared radiation. Examining the radiation from the atmosphere of such a world would reveal the presence of these beacons. 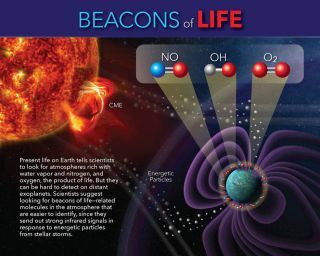 Since it takes a significant amount of molecular oxygen and nitrogen to create the beacons, their detection could indicate an atmosphere filled with biologically friendly chemistry, indicating a potentially habitable exoplanet. "Taking what we know about infrared radiation emitted by Earth's atmosphere, the idea is to look at exoplanets and see what sort of signals we can detect," said study co-author Martin Mlynczak. "If we find exoplanet signals in nearly the same proportion as Earth's, we could say that a planet is a good candidate for hosting life." The researchers first used a well-established computer model of Earth's atmosphere to find out how beacons could be produced from ozone — which is made up of three atoms of oxygen and forms naturally in Earth's upper atmosphere — in response to stellar storms from our own sun. By adjusting the model slightly, the researchers found that the ozone levels of a planet orbiting an active star would drop "to a minimum," leading to a high formation of atmospheric beacons, according to the statement. Next, the researchers wanted to know how bright the infrared signal would be from a world whose atmosphere contained nitrogen, oxygen and water vapor, and which was exposed to an ongoing onslaught of stellar storms. To answer this question, Airapetian and his colleagues relied on data from NASA's Earth-observing Thermosphere Ionosphere Mesosphere Energetics and Dynamics (TIMED) mission. An instrument aboard TIMED called the Sounding of the Atmosphere using Broadband Emission Radiometry (SABER) "studies the very same chemistry that generates the atmospheric beacons, as it occurs in Earth's upper atmosphere in response to solar activity," according to the statement. The SABER data revealed that the frequency of intense stellar storms is directly related to the strength of the infrared signals from the atmospheric beacons. If a nearby star is bombarding its planets with storms, enough beacons could be formed to be observed with a 6- to 10-meter space-based telescope in just 2 hours of observation time, according to the study. Future instruments, such as NASA's James Webb Space Telescope, could help to make even more detailed measurements, officials said in the statement. But even if a planet radiates these signals, that doesn't necessarily mean that life has evolved on its surface. Shawn Domagal-Goldman, an astrobiologist at NASA Goddard who was not connected with the study, said there might be other things that could produce the beacons. "This is an exciting, new proposed way to look for life," Goldman told Space.com. "But as with all signs of life, the exoplanet community needs to think hard about context. What are the ways nonbiological processes could mimic this signature?" The new study may help scientists search for alien life in distant solar systems, but it wouldn't be possible without a little help from our favorite habitable planet, Earth.